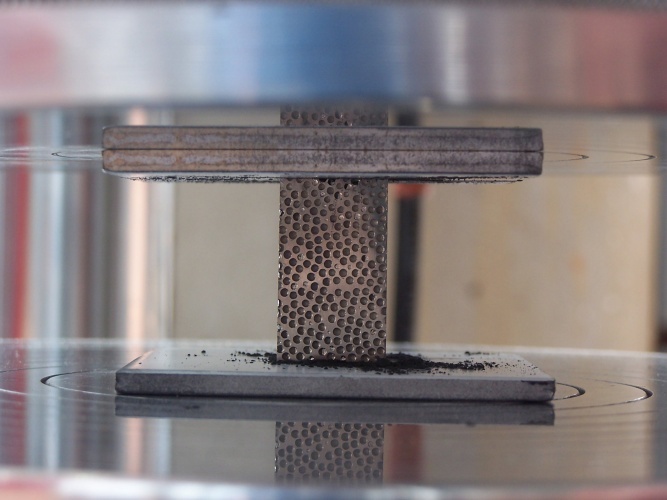 Lightweight composite metal foams can absorb energy from impacts and block X-rays, gamma rays and neutron radiation, according to a study from North Carolina State University. The discovery means the materials could be useful in spacecraft, the nuclear industry and in medicine. Aerospace and mechanical engineer Afsanah Rabiei originally developed the foams, which consist of hollow metal spheres of one metal dispersed in a matrix which can be of the same or a different metal, for military transport applications. They are mechanically strong, thermally insulative and lightweight, with their structure reducing the density compared with a bulk material, but Rabiei wanted to determine whether they could provide structural support while also shielding from radiation. Her research involved comparing foams’ shielding properties against pure lead and the A356 grade of aluminium, metals that are currently used for shielding purposes. Each comparison used samples of the same weight, but differing volume. The best results were obtained from a foam called high-Z steel-steel, which consists of stainless steel spheres dispersed in a matrix of high-speed T15 steel, an alloy containing trace amounts of vanadium and tungsten. The term High-Z refers to all the metals in the alloy having a large number of protons in their atomic nuclei; Rabiei’s team chose this alloy because tungsten and vanadium both have good radiation shielding properties. The tungsten-containing foam was modified so that its density was the same as a foam made entirely from stainless steel. The size of the hollow steel spheres seemed to have little effect, as long as the ratio of wall thickness to diameter stayed constant; however, smaller spheres (around 2mm diameter) seem to be more efficient in X-ray applications. Rabiei believes that the foams could be particularly useful in making vessels to transport nuclear waste, in protecting equipment on-board exploratory spacecraft from the high radiation fluxes sometimes found in space without adding significantly to their weight, and in protecting patients from radiation doses in CT scanners. The team discusses its work in a paper in the journal Radiation Physics and Chemistry. Way back in the 1980’s I was toying with a dimensional analysis technique for the equations used in larger system-sized equations that could only be solved using computers. I wonder if someone could use it to better understand why certain sizes work better for certain frequencies. If someone is interested i could deal with them directly – but soon as I am now 77 years old, not 77 years young!? I spent fifty years helping people ask better questions and this technique was intended to help in that way. It is amazing how nice it is to find better questions for a given job! Interesting question. N Tesla was working on the same problem.